Goat Simulator is an all-out, do whatever you want game by Coffee Stain Studios. 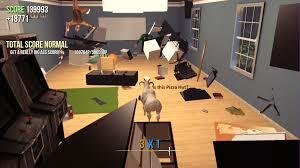 Goat Simulator is an all-out, do whatever you want game by Coffee Stain Studios. It’s similar to other “Simulator” games in that it has not the best physics. However, there is one thing that sets it apart from all the others; as you can see from the title, you are a goat. Just consider that for a minute; you get to play as a goat. You can even hit 1 to make the sheep make it’s little “baaaaaaaaa”-ing noise. You can baa just by hitting a button. Not only the amazing baa feature, there are many things for you to do, explore, and destroy. There is a road in the map where trucks and cars pass frequently, and you can lick or headbutt or just get hit by them. Licking is another amazing thing; you can hit e and just grab something/stick to something. For instance, there is a gas station next to a road and if you blow it up by headbutting it/the car inside (yes, headbutting any car makes it go boom) the entire thing will come falling down and the words MICHAEL BAY will flash on the screen. That’s another instance of when you do a certain thing, a little joke will pop up (it’s another type of score, it adds a big amount to it.) Also, I must add you can hit F for SLOW MOTION. 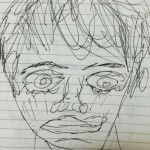 The not-too-working physics previously mentioned make me feel like this is even funnier. For instance, when climbing a ladder, you’re just standing still while your feet move forward and your head spazzes out beside you. However, lets not forget the easter eggs. There’s a little sacrificial circle where you can place 5 people and become a “demon goat” and be able to have a little ball of anything in front of you. Not only that, but I love the little trophy system; in different places all around the map, little golden goats are sitting there for you to collect. Collecting these gives you more “custom game” things. The one I love completely is “Tall Goat”. If you didn’t already think this (I sure didn’t), it is a giraffe. The “Tall Goat” changes your goat into a giraffe. I laughed as soon as this happened. 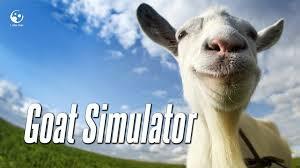 Goat Simulator is currently available on steam at http://store.steampowered.com/app/265930/ for $9.99. It is currently only available for windows. This is an amazing game and at $9.99 I recommend you get it. It’s pretty much a game for all ages and everything makes me laugh way too more than it should. From UFOs to sacrifices, this is an amazing game in my opinion. 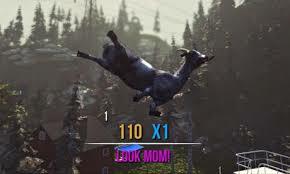 I give Goat Simulator 9/10 goats because although it is an amazing game to me, it definitely has more room for more features- and that’s a good thing.